Sweden's Throneless produce an all-enveloping Sludge/Stoner sophomore well worth investigating. There is probably no other genre fostering as much creativity as Doom Metal. The genre allows for big, open spaces in the music, a blank canvas for bands to paint the scene of their material. 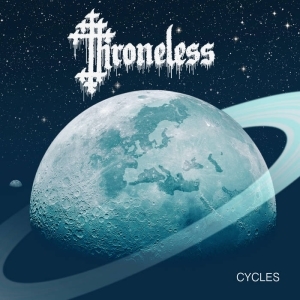 Throneless is a rather new band that hail from Malmö, Sweden. The band plays a form of Doom that has just enough Sludge to give it a solid groove. Think of Eyehategod playing covers of the "Peaceville Three". 'Cycles' is the band's second full-length. Their self-titled debut grabbed the attention of Jon Davis, guitarist and vocalist of the band Conan who signed them to his own label, Black Bow Records. Contained within is a visceral experience, an inner journey catalyzed by moving music that certainly grabs one's attention. The first major point that comes to mind when referencing this album is its all-consuming nature. The best albums have always been those that facilitated the listener being taken to another place. After all, isn't music about escaping anyway? 'Cycles' surely succeeds at this. Sometimes, the interplay between crushingly brutal low riffs and the melody created by all can lead to an almost chokingly blissful state. Perhaps that sounds New Age or convoluted, but in the same way as favorite albums have dazzled the inner spirit, so does this latest album from Throneless. The first track, 'Born in Vain,' begins with some massive distorted bass, a beloved fixture in this genre. It must be noted that the bass playing on this record is exceptional for it has its own lair in the frequency spectrum allowing it to always be perfectly audible, and it offers intriguing counters to some of the main melodies along with impressive runs and fills. When the guitars arrive, the sound becomes whole, full, and almost oppressive. The guitar tone in particular is noteworthy because it exists in the spectrum where it is just on the verge of total feedback. The guitar frequencies occupy a space above and around the bass forming a symbiotic relationship where each instrument is projected and defined more adequately. The guitar is covered in a depth of fuzz distortion that is overwhelming allowing the chords to sound much more massive and dark. The review would certainly e lacking were it not to mention the harmonoius, peaceful beginning of the second track, 'Cycles'. It aptly displays the band's penchant for dynamics. In an age where experts say that the art of the album is dead, traditionalists will be encouraged when listening to 'Cycles' for it has the peacks and valleys that make up what can be thought of as classic albums. Perhaps the revival of vinyl has aided the cause. The vocals mirror those of Neurosis. Somehow the strain evident from possibly having to repeatedly sing over the band or find the right note adds to the richness of the sound. Lacking lyrics, it is hard to say what is being sung, but unlike other bands where vocals seem to be something added to fill a slot because bands are supposed to have singers, the vocals are a legitimate third instrument. They more than capably round out the dimension of the sound. Fans of Doom and Sludge Metal will definitely appreciate this album. Specifically, the band does invoke the music of Thou, Electric Wizard, and YOB. At times, one can hear the subtle chord changes that resemble those employed by Anathema on their classic album, 'Eternity'. Throneless have managed to synthesize their influences into a mammoth beast of a sound, one that cannot be missed. This is an album the reader must definitely hear.